Victor Douieb’s passions run deep and are many, appearing to combine these notions of beauty and the sublime into one singular yet somewhat circular activity: when he sees a beautiful animal in its natural surroundings, he experiences something impossible to describe with words alone and is compelled to re-create the encounter in artistic form. Through this process, he closes the circle — from natural beautiful form to artistically beautiful form. 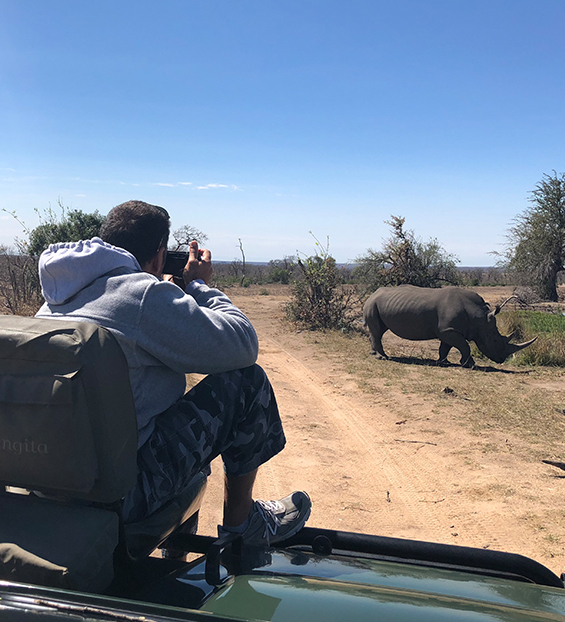 Asked where his true passion ultimately lies, Victor cites the crossroad of his elemental love of all animals and the sense of adventure he derives from the pursuit of getting as close to them as he can. Whether it’s scuba diving with sharks of all manner or getting into an enclosure with a tiger or wolf, witnessing these beings in their world with such deep respect for them is key to this distinctive rendering of immersion therapy. One of his first and still current passions is deep sea diving; an avocation he’d once hoped might have become his profession. As a boy growing up on the outskirts of Paris, France, animals with wildlife in particular captivated Victor as far back as he could remember. One of his earliest childhood memories was around age seven and skipping school to sneak into the circus when it had come to town. Standing as close as possible to the elephant and lion enclosures the scent of those powerful creatures became seared into his memory. To such a young boy their immensity created a potent and indelible impression. At 13 his family would vacation on the beaches of Spain each summer while he would instead spend his time at a nearby equestrian center, trading chores in the stable for a chance to learn how to ride horses. Victor would eventually become an excellent horseman and even own several Appaloosas as an adult. But his passion for animals truly ignited when he read Jacques Cousteau’s seminal work Le Monde Du Silence (The Silent World). Its subtitle “A story of undersea discovery and adventure, by the first men to swim at record depths with the freedom of fish” bewitched the young teen. He yearned to grow up and become one Dr. Cousteau’s “Aquanauts” so that he too could experience the magic of this hidden underwater universe. With respect to art, Victor’s only real interest in it was drawing. He would create designs for the backs of Levi jackets and logos for rock bands in Los Angeles when he moved there in the late 1980s, but sculpting never crossed his mind. The closest he’d come to that was as a dental technician handcrafting and casting crowns and other dental prosthodontics while briefly owning his own dental lab when still living in France. But it was in 2007 when he and a friend traveled to La Paz, Mexico to dive the Sea of Cortez hoping to glimpse the very shy and reclusive Great Hammerhead. 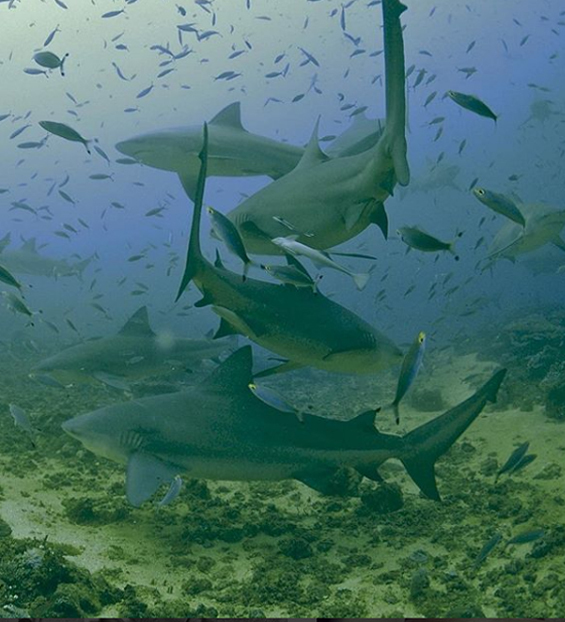 These waters were then well-known as the preferred nursery for the local hammerheads, though sadly no longer the case due to an increase in commercial fishing. With their tanks nearly depleted and without having seen the elusive sharks to that point, Victor and his dive buddy prepared to begin their ascent to the surface. They’d planned on adhering to the customary safety stops every 15 to 20 feet to allow for the elimination of dangerous nitrogen bubbles from their bloodstream. Suddenly out of the murky distance, a trio of hammerhead scouts emerged and encircled the divers who were backed up against an outcropping of large underwater boulders. The sharks were most likely scouts that swim ahead of the school to ensure there isn’t danger. Almost as quickly as they appeared they were suddenly gone. Thrilled to have been witness to this, Victor and his friend signaled to one another to ascend. Just then, out of the nebulous abyss the trio of sharks reappeared. Repositioning themselves against the rocks the divers again marveled at the majesty of the enormous creatures investigating their presence. Quickly once more the sharks swam away. With scuba tanks now dangerously low, the men quickly began to make their way to the surface. Victor’s tank ran out of air half way up which meant he was unable to perform the final safety stop and fearing decompression sickness (the bends), he resumed breathing compressed air from a fresh tank once back aboard the ship. As a precaution, he was advised to spend a day in a decompression chamber: the closest was nearly 100 miles away in Cabo San Lucas. The combination of a maniacal taxi driver and his mad dash to Cabo, a day in a hyperbaric oxygen chamber, and a missed flight to Los Angeles, was no match for deflating Victor’s exuberance from his encounter with the hammerheads. He was determined to find a memento of his experience and spent the following day scouring small boutiques and other trinket outlets in Cabo. The tourist trap was known for its souvenirs and novelties but Victor was unable to locate anything befitting his otherworldly adventure. “I couldn’t find anything that I would have wanted to display on my living room table, so I decided that when I got back to LA, I’d sculpt my own.” Despite having never sculpted in clay nor cast in bronze, Victor’s first edition of Hammerhead sold quickly, as did the second and third. Before long, inspiration would strike and he would soon be at work creating another sculpture, a ritual he would come to repeat again and again. His works have been cast in gleaming stainless steel, solid gold, and in bronze finished with dazzling patina. 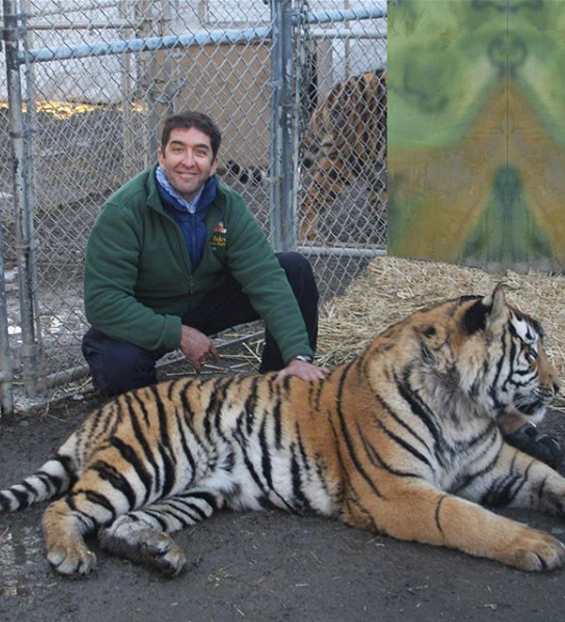 Victor in tiger enclosure in Spokane, WA. 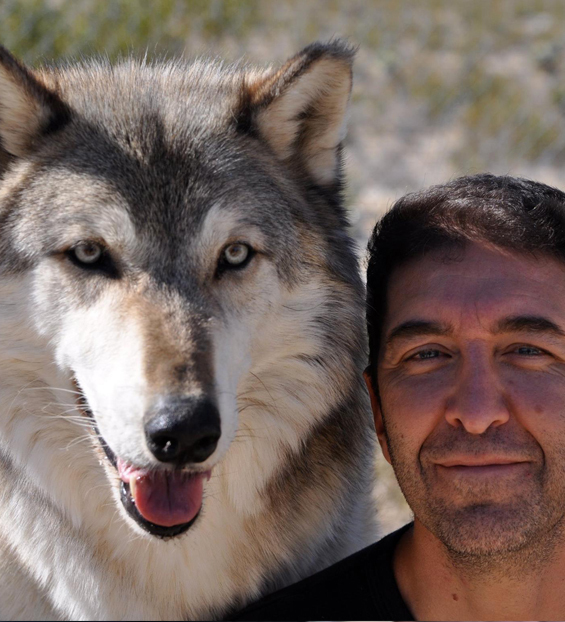 With a friend at Big Bear’s Wolf Sanctuary in California. 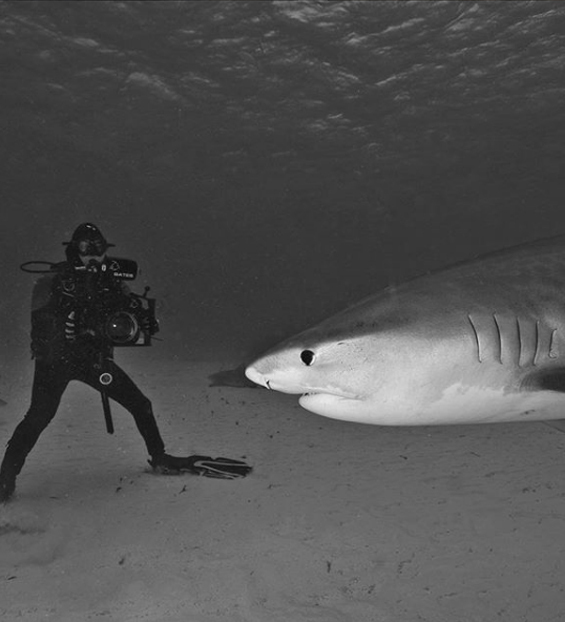 Victor photgraphing a Tiger Shark in Tiger Beach. 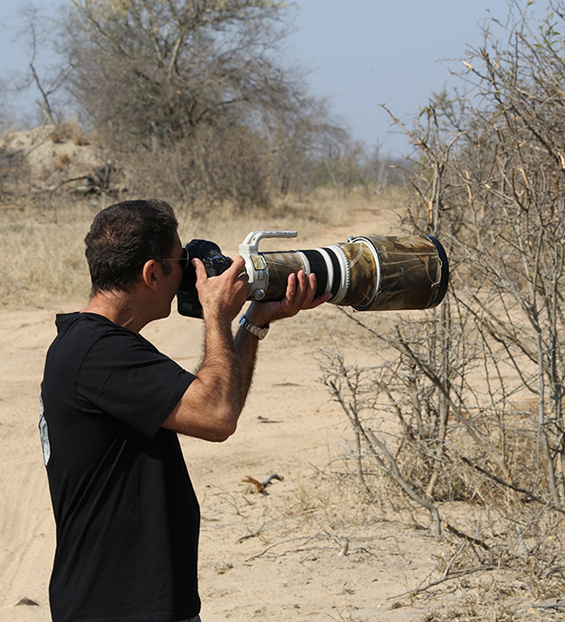 Through this constant ongoing process, Victor has become deeply concerned about the rate at which entire species of life on our planet is rapidly and permanently disappearing. He’s determined to use his art as a kind of voice for animals in the sea and on land who have too few advocates working on their behalf. He donates time and energy to environmental organizations he respects and has been a guest lecturer at several major municipal aquariums throughout the US. One topic that’s been a reoccurring focus is the widespread reef destruction due to the invasive lionfish in the Caribbean, Gulf of Mexico, and southeastern US seaboard. Victor’s lectures have included educating the public about the lionfish invasion currently devasting marine ecosystems in the Gulf of Mexico and throughout the Caribbean. Victor also gifts certain proceeds from the sale of his art and from his first book Solid, Liquid, Modern and Ancient: The Sculptures of Victor Douieb. The artist also regularly participates in events where he can help spread the message about the importance of conservation. Noted artist and marine biologist Richard Ellis described Victor when writing the book’s foreword: “Through his passionate and innovative work, Victor Douieb has placed himself at the top of a very small group of artistconservationists whose art is created not only for the art-lover, but also for the sake of the very animals they depict.” In January 2015, Victor traveled to the Bimini chain of islands in the Bahamas where he again beheld both the beauty and the sublime diving among Great Hammerheads. 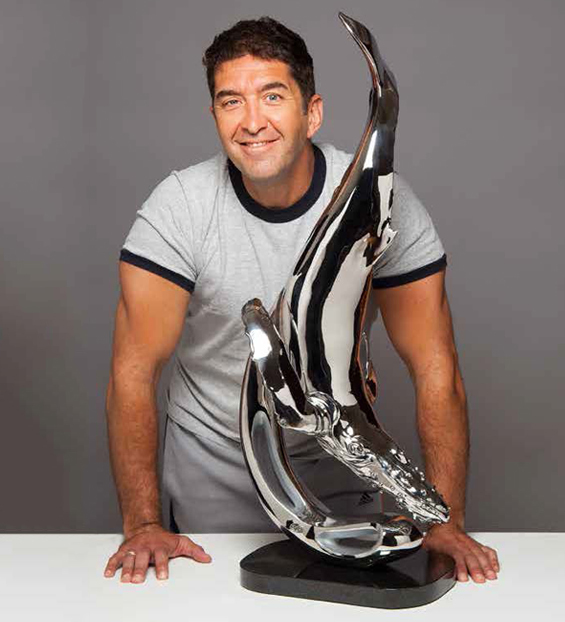 Victor says, “I became a sculptor after seeing those hammerheads and being with those amazing creatures in La Paz. This time, it really helped me to appreciate these past seven years as an artist. Now I’m looking forward to the next seven.” And so, once again Victor Douieb brings his passion full circle.